The Ricoh Aficio SP C410DN is a full-color workgroup laser printer with fairly standard print speeds, a typical footprint, and features largely typical of models like it. Little sets it apart, but it may be a fine choice for small offices in need of a device to handle both black and color jobs at acceptable speeds. The printer measures 17.6" by 23.2" by 19.2" and weighs 110 lbs. It would likely fit on a desk, in its own cabinet, or on a credenza without much trouble. The SP C410DN produces documents at 26 pages per minute, both in black and in full color. This is slightly above the standard 20 pages per minute offered by almost any device, but many newer printers can offer speeds of 40-50 pages in both black and in color. It supports resolutions of 600 by 600 dpi, 1200 by 600 dpi, and 1200 by 1200 dpi across all configurations, consistent with most models like it that support color and monochrome printing. 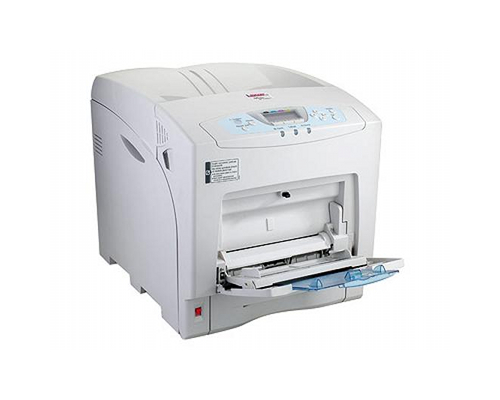 The SP C410DN has a standard paper capacity of 550 sheets and a 100 sheet bypass tray. Two optional paper trays at 550 sheets a tray allow the printer's capacity to be expanded to a maximum of 1750, over three reams of paper and well over what a small to medium office likely consumes in one day. Duplexing is standard and moves documents at almost 100% simplex speeds. The printer can process documents sized between 2.8" by 5.8" and 8.5" by 14": it supports non-custom sizes 8.5" by 11", 8.5" by 14", 5.5" by 8.5", and 7.25" by 10.5". The SP C410DN comes with 256MB of RAM standard, which can be expanded if desired to 512MB via 128MB or 256MB DIMMs. A 40GB hard drive is also available as an add-on. The printer includes a 10/100BaseTX Ethernet port and a USB 2.0 port for connectivity, with many optional connections possible: IEEE-1284 Parallel, 802.11b (with WPA support), Bluetooth, Gigabit Ethernet, and USB Host Interfaces are all available. To ensure forward and backwards compatibility, the printer features simultaneous auto-sensing/autoswitching support for TCP/IP, Novell IPX/SPX, AppleTalk, SMB, and NetBEUI. It supports Adobe PostScript 3, PCL5c, PCL6, Ricoh RPCS, and PDF Direct print languages. With the USB host interface installed, users can print directly from any PictBridge-enabled digital camera. A number of options are available to add new functionality to the printer, such as an add-on scanner, which adds scan-to-email via LDAP, scan-to-folder, scan-to-FTP, TWAIN scanning, and scan-to-print to the printer's functions. Note that this adds a table to the printer and will likely both increase its weight and the amount of space that it occupies. A paper feed unit is available as well. It supports paper sized 8.5" by 11", 8.5" by 14", 5.5" by 8.5", 7.25" by 10.5", A4, envelopes and some custom sizes, and one or two 550 sheet units can be installed. The printer includes a User Account system in order to monitor and restrict printer usage. The system is accessible via the internet or one's network and includes 30 user codes standard, which can be expanded to 500 with an add-on User Account Enhance Unit. Systems that plan on using multiple ports should note that many Ricoh models do not make it possible to install multiple expansion ports simultaneously, making it only possible to use Ethernet, USB 2.0, and one other interface at a time. 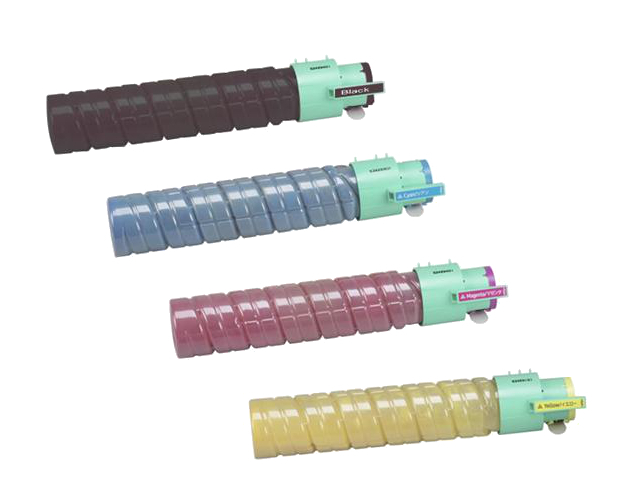 Review it: "Ricoh Aficio SP C410dn "
The Aficio SPC410DN consumes and requires four toner cartridges: black, cyan, magenta, and yellow. 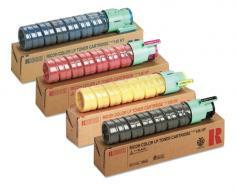 All four cartridges are rated at 15000 page yields at 5% coverage. 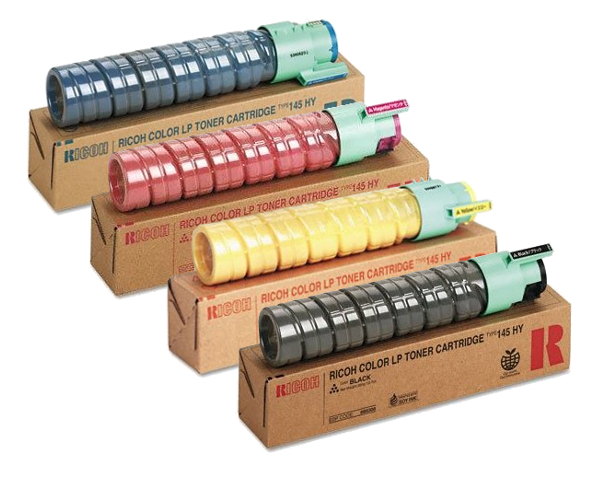 The Aficio SPC410DN also requires replacement for its waste toner bottle at every 125000 pages, its photoconductor unit at every 50000 black pages at 5% coverage and its color photoconductor units at every 50000 pages at 5% coverage per color. Unfortunately, the cartridges and consumables replacement schedules do not conveniently sync with each other; however, the fact that the components are separate does mean that long-term maintenance costs go down at the time expense of increased maintenance.